There is a lot of benefits from learning how to spot overbought oversold situations in the general markets. Overbought situations will tell you to sell some shares while oversold situations will tell you it might be conducive to buy stocks. But how do you determine if the stock market is overbought? How do you determine if the stock market is oversold? Should you really buy stocks when the market is oversold? You might be buying a falling knife. On the other hand, an overbought market can continue to move higher and higher after you sell your stocks. In this article, we will examine how to correctly use overbought oversold situations in the market to time our trades. 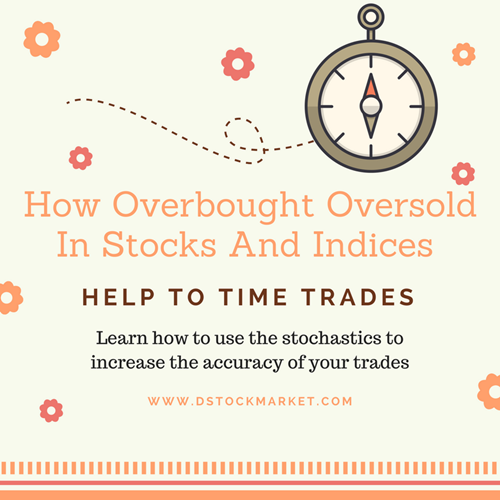 In order to be fully able to utilize the times when the stock market is overbought or oversold, we first of all need to understand what is overbought and oversold. So what is an overbought situation? What is an oversold situation? When Is The Market Considered To Be Overbought? I will explain each one in a little more detail. This is more towards common sense. It is important for us to remember that the general markets like the S&P 500, the Dow Jones and the Nasdaq Composite do not go up in one straight line. It often goes up for a few days and then goes back down. That is why we can consider the market to move in waves. There is no set number of days that we should consider as an overbought situation. But it all depends on the market environment. If the stock market has been trading sideways for a while then we can consider a 3-5 days rise to be overbought. The more days it rises the more possible a correction will happen. So the more days the market rises, the more dicey it is to buy stocks. Which is why the professionals will consider whether they should sell their positions on day 3,4 and 5. On the other hand, the amateurs always think about buying the markets and buying more stocks on day 3,4 and 5. 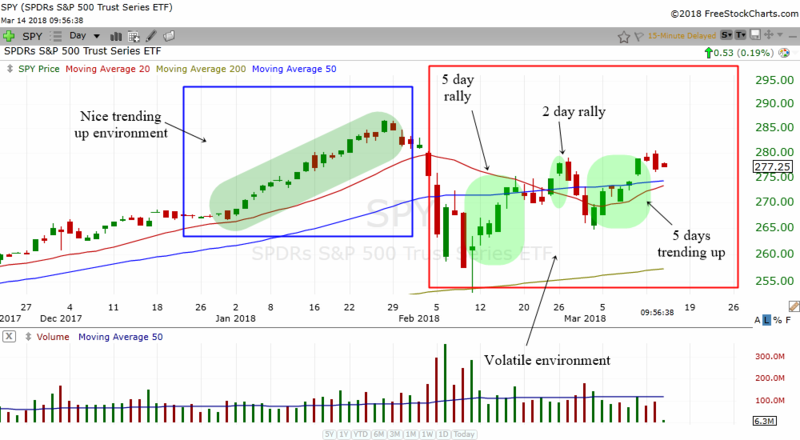 In the chart above, we can see how how the SPY went from a nice trending up environment to a volatile environment. I have highlighted the volatile environment with the red box. This is where the market is very choppy. When the market is choppy, one should be very cautious when it goes up 3-5 days. The odds of a correction increases with each passing day. During the nice trending environment which I have highlighted with the blue box, the market kept going higher for many many days. The market became very overbought but it did not go down for quite some time. That is because when the market is in a nice uptrend, it can go up and up and up for many many days. Which is why it is best to use a moving average as a sell signal when the markets are trending up powerfully. In this case, the 20 MA acted as a very nice sell signal. If the market is in a strong trending environment it can often go up non stop for 10-15 days. This will make the readings of many indicators to be very overbought. But a strong trending up environment is rare. Usually we can use the moving averages to help us take profits or be cautious. When the SPY drop below the 20 MA, it was time for traders to exit the market. Anyway, do remember that the stock market does not go up non stop indefinitely. So the more days it goes up, the more cautious you should be. When the market runs up too much too fast, it will fall down just as fast and perhaps even faster. Technical indicators or oscillators are very good to show us whether the market is overbought or oversold. A very important thing for you to remember is that not all overbought and oversold readings will result in a correction or rebound. It just tells us that we should be cautious. There are plenty of technical indicators out there that show us overbought oversold readings. Let me show you one very useful oscillator called "stochastics". Basically the way to use the stochastics is when the oscillator is above 80, it is overbought. When it is below 20, it is oversold. By the way, the stochastics settings that I use is the 14,3,3. 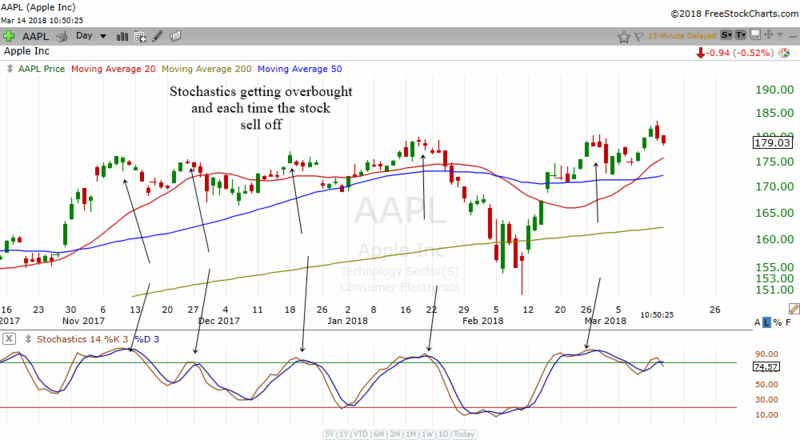 The chart above shows the daily chart of Apple with the stochastics indicator. Notice how each time the stochastics go above 80, the stock corrected. 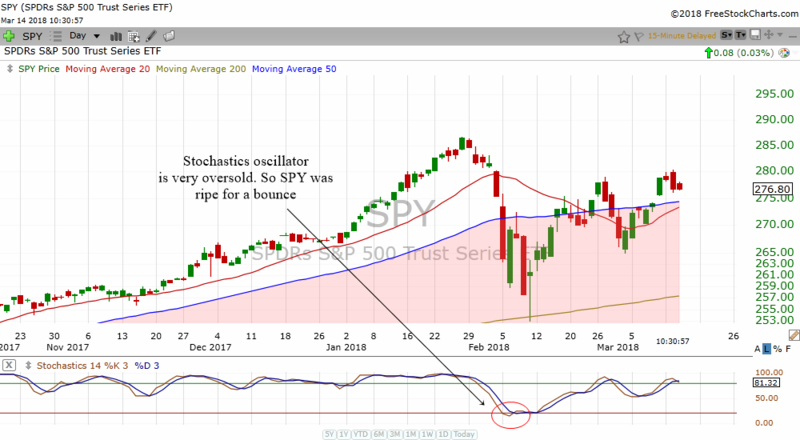 In late January 2018, the oversold stochastics hinted of a big fall. This time Apple did not just correct, it actually plunged. I'm showing you the chart of Apple instead of the SPY because SPY has been trending up very nicely. Therefore, SPY's stochastics reading will be overbought for a long time. You can have a look at the chart of SPY with the stochastics indicator below. This situation tells us that overbought oversold indicators work best when the stock or market is not trending. It works best when they are trading sideways. When the market is trending, it is best just to use moving averages to know when its best to take positions off an uptrending overbought stock. When Is The Market Considered To Be Oversold? The chart above shows the daily chart of SPY but this time I added the stochastics oscillator. Notice how the selloff caused the oscillator to move to an oversold level. When the stochastics was at an oversold area, it told us to be ready for a possible bounce up. In fact the markets found support at the rising 200 day moving average and then proceeded to rally back up nicely. So traders should be on the lookout for any trading setups for longs. The oversold situation indeed provided traders with a nice bottom fish trade in the market as the market rallied back up nicely. Overbought oversold readings in technical indicators can also work in other time frames. Try not to get attached to the daily chart. You need to broaden your horizons and look at other time frames such as the 15 min and 60 min. The smaller time frames can often give us an early warning of a reversals. Take a look at the 60 min chart of DIA below. The black arrows represents overbought areas that are shown by the stochastics. 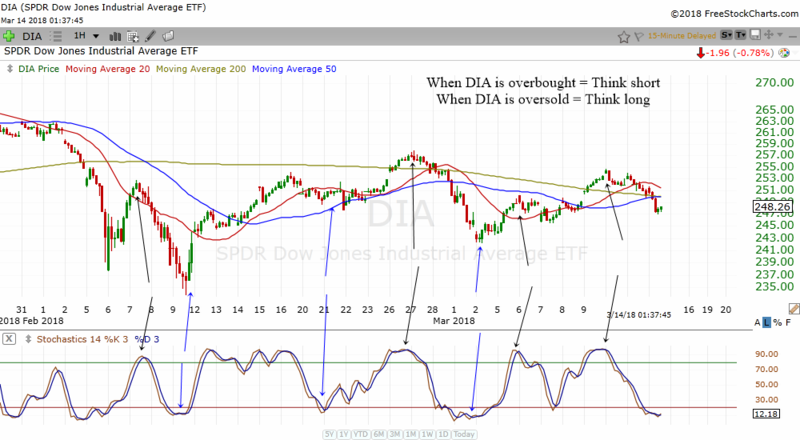 Notice how the DIA had a drop or correction when the stochastics had an overbought reading. The blue arrows represents oversold areas. Notice also how the DIA rises when the stochastics had an oversold reading. If you utilize the stochastics in the 60 min chart, you can often find trading opportunities. If you look at the chart above carefully, you will also realize that there are times that they do not work very well. You can perhaps reduce the whipsaws by only concentrating on signals that moves from one extreme to the other. For example, if the stochastics move from overbought > 80 to oversold < 20 in one fluid railroad track motion then you will want to take the oversold signal more seriously. If oversold signals happen when the stochastics move from 50 to < 20, you might want to ignore it. The lesson in this article concerning overbought oversold is quite simple. We use the moving averages like the 20 MA to time the markets when the markets are trending. And we use the stochastics more if the markets are trading sideways to time the markets. The system and strategy in using these indicators are simple. But if you learn them well, you might be able to increase the accuracy of your trades.